The giant Atlantic Salmon statue adorns the waterfront of the Restigouche River in Campbellton, New Brunswick in Canada. A sunny day on the waterfront of the Restigouche River in Campbellton, New Brunswick highlights the J.C. Van Horne Bridge and the Atlantic Salmon statue. The Atlantic Salmon has been named Restigouche Sam which stands at 8.5 meters high overlooking the river. Monument of an Atlantic Salmon (8.5 metres high) named Restigouche Sam, along the waterfront of the Restigouche River, backdropped by The J.C. Van Horne Bridge in the town of Campbellton, Appalachian Range Route, Highway 11, Restigouche, New Brunswick, Canada. 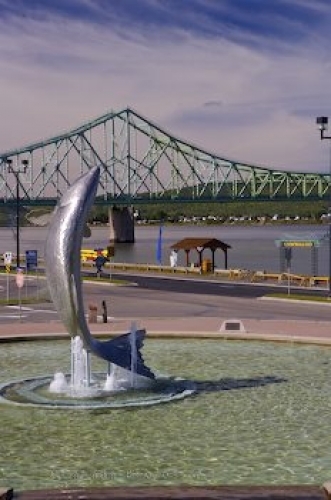 Picture of an Atlantic Salmon statue on the river waterfront in Campbellton, New Brunswick.